KOKRAJHAR, India (CNS) — Besides her family, the most valuable things Majoni Bibi has these days are a few clothes, medicated mosquito nets, cooking utensils, water storage buckets and sleeping mats. Bibi, a Muslim refugee forced with her family from their home as fighting erupted in July between tribal Bodos and Muslim settlers in Assam state, praised Catholic relief workers for the donations as her family continues to live in a camp for internally displaced people. “We are very happy the Christians have helped in a big way. But for them, our life would have been miserable,” said Bibi as she held her infant, who was born the camp at Basagaon. Bibi is among hundreds of thousands of people displaced by months of ethnic clashes. She told Catholic News Service that had it not been for Catholic-run charities and the efforts of the Missionaries of Charity sisters, she and her family would have little. “These sisters cared for us and (church workers) gave valuable and useful things,” said Bibi, pointing to Sister Jacoba, superior of the Missionaries of Charity convent in nearby Bongaigaon. Church workers have visited the camp and several others in the region, providing food and a variety of services and supplies. The fighting has left more than 90 people dead and about 500,000 homeless in Kokrajhar region. More than 200,000 refugees — the majority of them Muslims — languish in 130 relief camps scattered across four districts. Several Muslim refugees shared their appreciation for the workers’ dedicated service in the camps in the Bodo heartland. “The only people who came out to help us were the Christians,” said Jahanara Begum, living in a riverbed camp in Basagaon. Begum told the church workers that she had lost thousands of pounds of raw rice she had stocked in her home for sale when she, her husband and five children fled Dewalguri, a village attacked July 23. “The church workers have shown real love for us and visited the camps regularly and attended to our people,” Begum said. Father David Napoleon, director of the Bongaigaon Diocese’s social service program, said he has coordinated his work with Catholic Relief Services and Caritas India. More than two dozen emergency workers, including medical teams from St. Augustine Hospital in Bongaigaon joined the Missionaries of Charity sisters in visiting the camps. “But it has not been easy. Nearly 15,000 Christians among the Bodos have also become homeless and some of our people have been strongly objecting to reaching out to the Muslim refugees,” he said. “But we told them that this was a humanitarian crisis and as true Christians, we have the duty to help all those in need,” he added. “The care and attention the Christians have shown to our people has helped change their attitude to the Christians. Real friends are those who help the people in need. The sisters have shown us what is real love,” Mondal, a Muslim, said of the Missionaries of Charity who had helped bathe refugee children. The anxiety of the Bodo community over Christians reaching out to Muslims was evident during a visit to Bodo relief camps in the town of Kokrajhar. “My husband was stabbed (to death) and how can we can go back and live in the same place?” asked Korida Sanhala of Fakiragram village, who was at the Bodo camp. 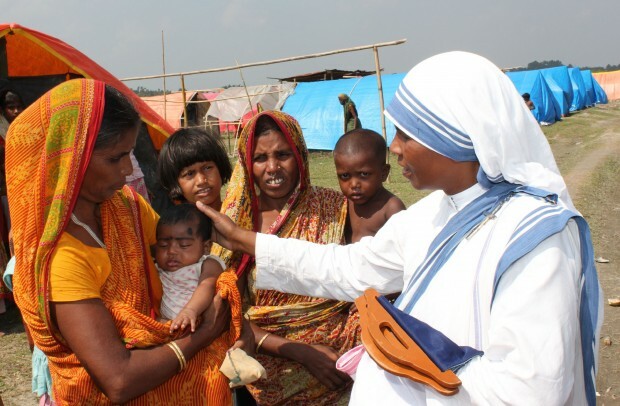 “Sister, why do you still go to the camps of those (Muslim) people?” posed another Bodo woman to Missionaries of Charity Sister Leo Therese, even as men of the Bodo community rejected the plea of government officials to return the refugees to their village. “They should not be helped,” a young Bodo refugee woman reminded another nun when the church workers reached the Catholic relief camp at Kailo Mailo, more than 60 miles from Basagaon. “Now our main focus is on youth-centered programs to deal positively with their trauma and anger and foster healthy interpersonal relationship,” said Kaplianlal Thangluai, program officer for CRS in northeast India. The program is facilitated by CRS-trained volunteers selected from among the refugees and residents of the host villages. “We are also running a child-friendly space for children in the relief camps, as the children do not go to school,” Thangluai added.